David, P.p.. "Desert". The Canadian Encyclopedia, 29 May 2018, Historica Canada. https://www.thecanadianencyclopedia.ca/en/article/desert. Accessed 19 April 2019. The paucity of precipitation in deserts is due to one or a combination of causes. Oblique airphoto of an active giant parabolic dune in the Williams River sector of the Athabasca Sand Dunes of Saskatchewan. Tall grass vegetation on the dune is located where groundwater seepage occurs (photo by P.P. David). A desert is a region where evaporation greatly exceeds precipitation, resulting in a water deficiency that only a few life forms can endure. Extremely arid deserts with under 125 mm of rainfall annually are totally barren whereas sparse vegetation and scant animal life survive in arid deserts with less than 250 mm. Rain occurs usually as high-intensity storms only once every few years. In addition to the sparsity of rainfall, high evaporation rates remove whatever moisture may be present. Air Masses The presence of downward circulating air masses, as in the tropical high pressure climatic zones located between 15° and 35° latitudes on both sides of the Equator, provides for very dry air masses at all times. Location The remoteness of inner continental areas from oceans inhibits moist air from reaching those lands. Mountain Barriers High mountain chains form physical barriers to oceanic air masses from reaching inner continental areas. They force the moisture-filled oceanic air to rise, which then condenses and looses its moisture content. On the lee side of mountains, moisture deficient air masses descend. As they descend they expand and become warm and very dry, producing the well-known katabatic winds such as, the CHINOOK wind, which originates in the Rockies in western Canada. Ocean Currents Cold oceanic currents travelling toward the tropics from polar regions along the west sides of continents cause hyperarid conditions on the adjacent lands, producing the world's driest regions, including the Atacama Desert in Chile. Because desert air is very arid, during the day there is nothing to impede solar energy (insolation) from reaching, and heating, the land surface, which, in turn, heats the desert air to very high temperatures at night; for the same reason, there is nothing to prevent the air from losing its heat (radiation). This results in unusually high daily temperature fluctuations. Maximum air temperatures of almost 60° C in shade and ground temperatures as high as 83.5° C have been registered in sandy desert surfaces dropping to single digit values at night. Annual temperature maxima may vary between -40° C in the winter to 80° C in the summer in shade. 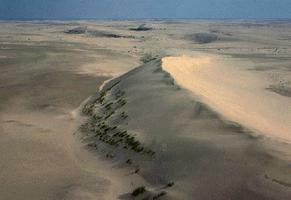 Deserts are characterized by a suite of landform features that are unique to them. They include a variety of both erosional and constructional features, including mountains and plains. Desert mountains, tablelands and plateaux, wind-abraded rock yardangs and low-relief stony plains are very old features that have undergone a long geological history of formation, weathering and subaerial erosion. In detail, the mountains and other relief features have angular forms and terminate rather abruptly at the edge of plains, where they are replaced by gently inclined, concave, eroded bedrock surfaces (pediments) covered by alluvial sediments. Locally, several pediments may occur in steplike arrangements (treppen) separated from one another by steep, sharp escarpments. Most desert regions have internal drainage, where runoff waters are directed toward central, low-lying depressions by ephemeral streams in channels (wadis, or arroyos). It is in these basins that depositional landforms occur in deserts. At their margins, next to the mountains, a narrow band of alluvial fans or coalesced fans (bajadas) develop from the deposition of coarse-grained fluvial gravels and sands. At the centre of the basin an ephemeral water body (playa) may be present which occasionally receives runoff carrying fine silts and clays. Rarely, a playa lake may form rapidly following intense rain storms but lasting only a few days or weeks. In the more extensive deserts, low-lying areas may sustain a generally shallow, more or less permanent saline lake. Relatively small portions of desert regions (20% or less) are occupied by sand dunes, which may be transverse, barchane, elongate (also called longitudinal or seif), star or dome shaped (see AEOLIAN LANDFORMS) depending on the local aeolian environmental parameters. The geological record from Earth's desert regions indicates that climate has not always been as rigorous as it is today. Most desert regions have undergone cyclic climatic changes ranging from humid and sub-humid to semi-arid, arid and even hyperarid. 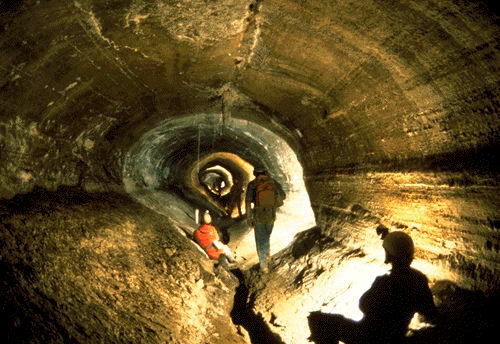 During the Quaternary Ice Age, global climate cooling reduced evaporation rates, which, coupled with higher amounts of precipitation, resulted in excess water accumulation, flooding many of the enclosed drainage basins. Present-day climate fluctuations are such that desertlike conditions are expanding in most places in the world. If GLOBAL WARMING continues then deserts will invade the less arid marginal regions, which would have catastrophic consequences for any life forms there. Desertification is a term that describes humans' contribution to the formation or expansion of desert regions through careless destruction of the fragile physical and biological environments and by the thoughtless exploitation of natural resources, principally groundwater. Canada has no true deserts, only regions that exhibit some desertlike features. 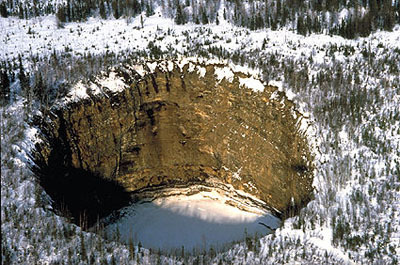 For example, the sandy expanse south of Lake Athabasca is an aeolian environmental aberration, which lies within the northern forest region with a humid CLIMATE. Botanically, it is a desert because groundwater necessary for the establishment of permanent vegetation is far too deep and seeds that germinate at ground surface die before their roots can reach the water table. This "desert" area formed on raised, coarse-grained sandy and gravelly, glacial-deltaic deposits retains insufficient surface moisture to allow vegetation to become established. The region is occupied by large sand dunes separated by pebble- and cobble-covered, wind-eroded surfaces (reg). 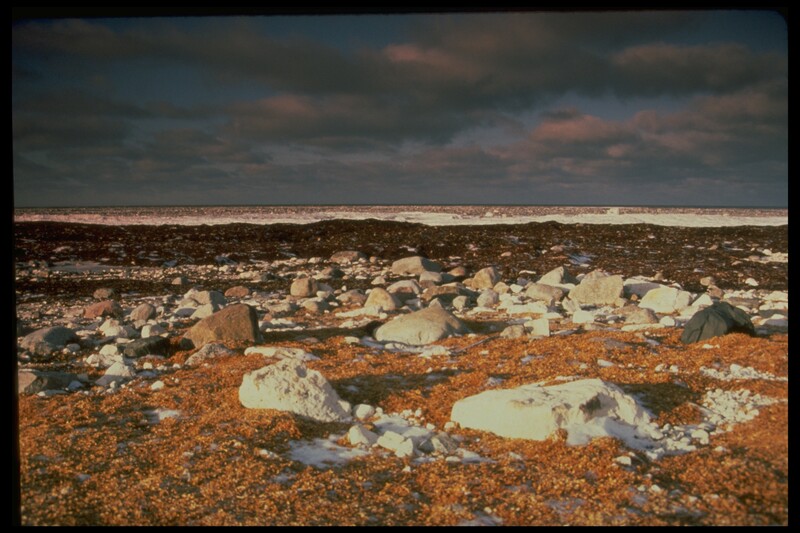 Smaller areas in the Canadian Arctic, lacking vegetation and being exposed to strong winds, also exhibit desertlike appearance. In the droughtiest parts of the prairies in southwestern Saskatchewan and adjacent Alberta (including the somewhat cooler and consequently more humid Cypress Hills Plateau), and in the most southerly parts of some of the major river valleys in the Canadian Cordilleras, precipitation can be as low as 250-300 mm and vegetation is of the semiarid type including sagebrush, rabbit brush, etc. On the semi-arid prairies, extensive saline lakes located in the centres of closed basins contain proxy data indicative of a long history of alternating humid and droughty climates. Recent climate research there suggests that global warming could adversely affect not only the presently semi-arid portion of the prairies by turning them into desert regions, but would extend beyond these limits into the most valuable Canadian agricultural lands. Journeys & Transformations: British Columbia LandscapesExplore the fascinating natural and human history of British Columbia through this multimedia website from the Royal British Columbia Museum.